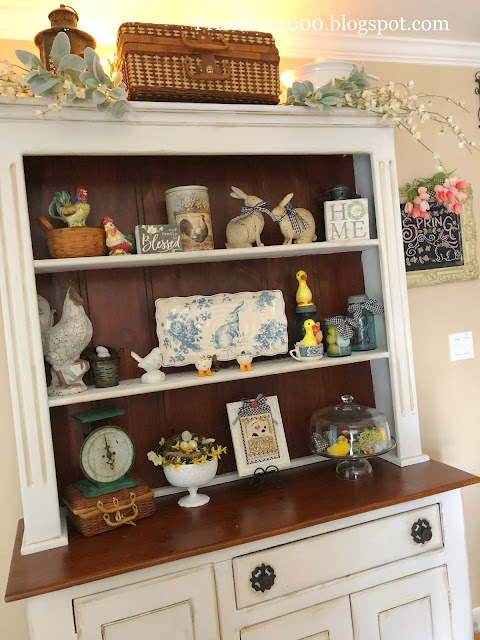 Priscillas: I Painted The Craig's List Hutch! 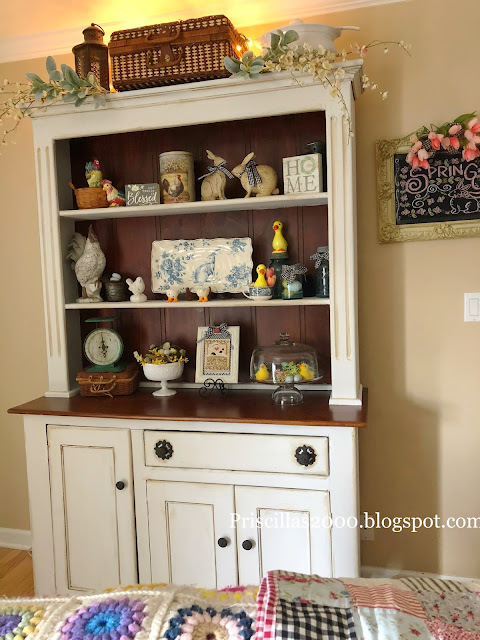 Remember my Craig's List hutch ? I painted it! 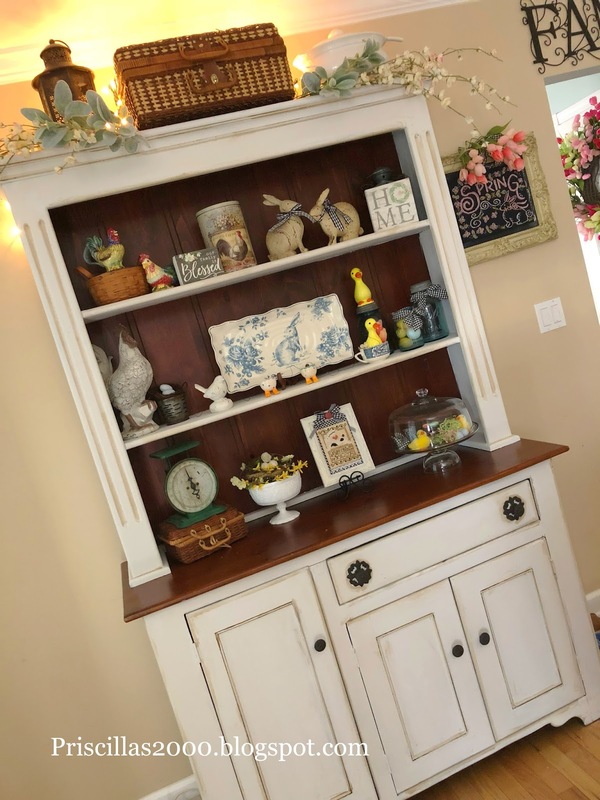 A couple weeks ago I painted it off white with Rustoleum Chalk Paint.. I left the top and back wood .. I bought new wrought iron looking knobs at Hobby Lobby ..
Don't you love this cake plate filled with baby ducks a nest and some flower picks ? 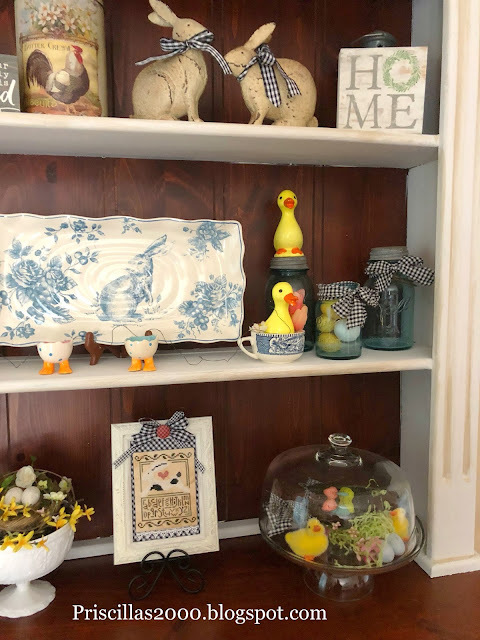 On the top I have some spring flowering branches ..some Lambs ear ..a vintage picnic hamper ,, an ironstone soup tureen and a lantern .. Seasons in Chalk art Spring hangs on the wall ..
Looks great!!! Are you going to change the colour every season? ?😉 I love your podcast with Chelsea!! This is absolutely stunning!! Definitely there should be lights to add to its beauty. Are you going to give us a closer look in the next Floss Tube video? The have stick up lights, you could use. U like it painted. Beautiful! It looks fantastic! You did a great job painting and decorating! It really does look amazing!! That is exactly what I am looking for! It looks great, just the right amount of aging. 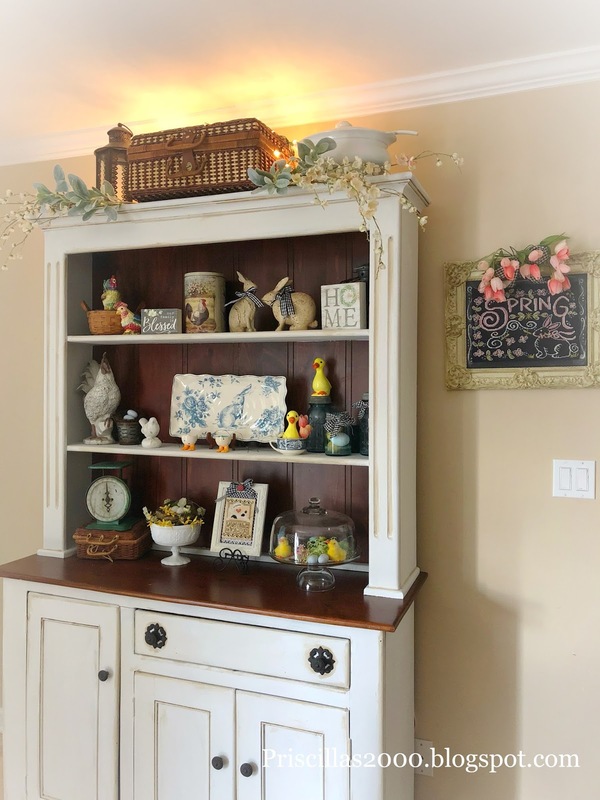 Have fun decorating your pretty white hutch for the seasons and holidays:). IT really turned out adorable. 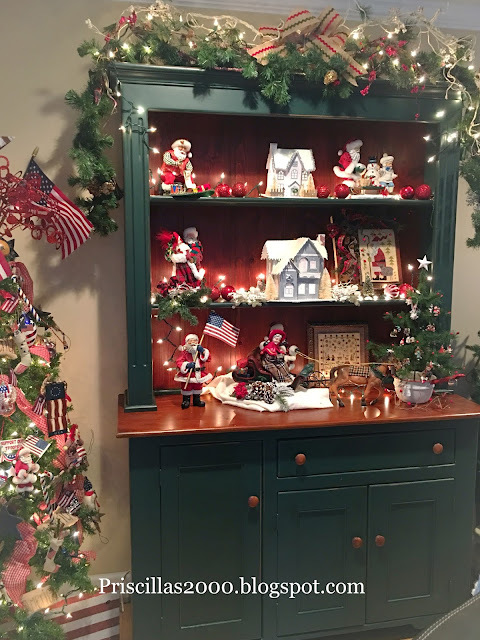 At Christmas I would have said it didn't need painting, but it looks so cute now that I have seen it. Good call. Wow, that looks great -----I'm glad you left some of that beautiful wood showing. Really makes the details jump out at you!. 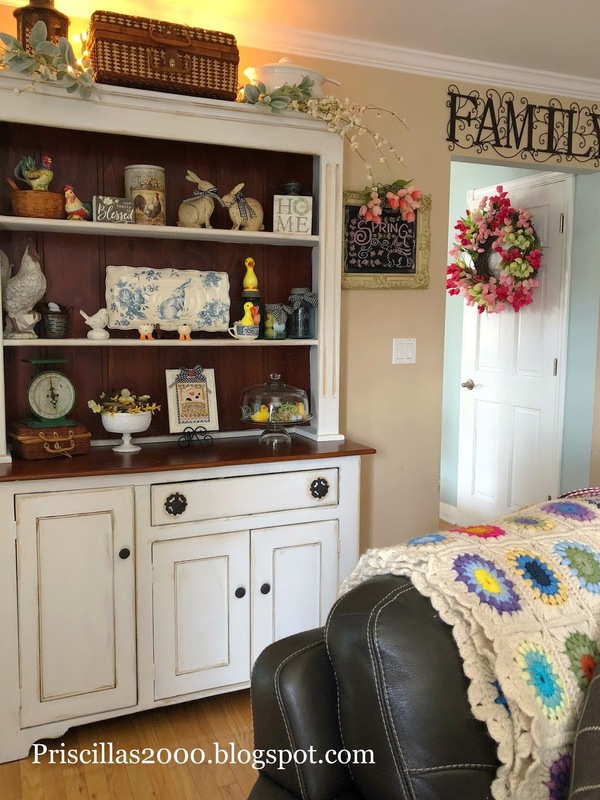 That is a gorgeous painted hutch! The wood just makes it perfect! And your dark stain touch up really made it look 'vintage'. Congrats on a successful transformation! Hugs!